Join the discussion on our forums! Come discuss Fluffy Epic Mage over in our dedicated Fluffy Epic Mage discussion topic. Ok....am I the only one that read it as literally "hand size?" Im sitting here with a tape measurer measuring the width of my hand trying to figure out how big of minion the battlecry will give me. After coming here I'm disappointed and embarrassed to see its the size (number) of cards in your hand and not actually how big your hand is AKA the thing with fingers and a thumb on the end of your arm. Probably the worst joke I have ever read in my entire life. Maybe elemental mage is getting enough support. That deck always has a full hand and people are playing mountain giants. Good comparison is obviously spiteful summoner, very simmilar stat line and cost. But this card is less restrictive than spiteful summoner, all you need is a lot of card draw you don't have to cut all the cheap spells from your deck. Faceless Summoner that costs one more mana and a changeable effect. Seems pretty good. went through the list , if its a truly random card then it barely summons anything good , just go through the list youll see what i mean , cards with mana 7 to 9 are almost exclusively understated minions with good battlecries apart from a few exceptions . The card is great the pool of summons is bad . We've had handlock hand-druid now behold the handmage! Honestly I don't like cards which effect ranges from trash to overpowered in certain situations. I'm a bit afraid of this card, to be honest, it seems really good, a bit worse than pre-nerf Spiteful Summoner but without the restrictive downside..
We'll see, I hope this card won't be oppressive. Spiteful Summoner but with a little more control and gives fast drawing combo decks big minions on the board. Really dangerous but fun. The entire theme of mages this xpac is astronomy...The druid theme is goop. This might be good but am I the only one who like Fluffy Epic Mage name more? I say this is the new Spiteful Summoner. Especially with cards like Aluneth, I believe this will be good enough, if not very good. I think this card is simply bad. For an aggro/tempo based deck this card its unplayable. Nothing to speak about. 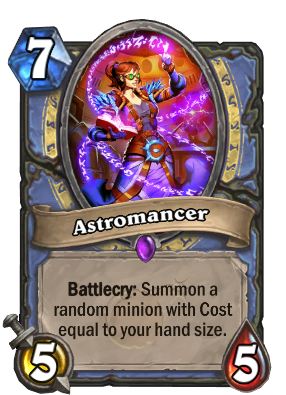 For a control deck, people rather use a fix removal (like in big mage), than an RNG card, Just because a deck is control, it doesn't mean you hand size will be 7-9 card consistently. This card will never see play, if not in Elemental mage, but i highly doubt. This card is very similar to Faceless Summoner, but at least it's not common and it costs more.